So far, we’ve talked about seeing where you and your customers are, and where you’ve been – how your customers feel about how your business has treated them in the past, and how they are treated now. But a good customer experience survey system can tell you much more than that. It can tell you the strength of the emotional connection that your customers have with your business, and the basis of that connection – why they feel that connected. And it can also tell you more than a little bit about the future. First, consider customer attachment. Do your customers buy at your store simply because it’s the only one around, or because it’s the most convenient. If that’s the case, their level of attachment may not be very high at all. But if doing business with your store makes them happy, makes them feel good, makes them actually look forward to the next time that they buy something from you, then there’s a real emotional attachment – and that’s a very valuable asset. Emotional attachment is the basis of building customer loyalty , and it provides you with a strong foundation for maintaining a loyal base of customers over time. THE ALR system includes the tools you need to understand your customers’ emotional connection with your business, and to build and maintain customer a high level of loyalty and retention . A good customer survey and analysis system is also a first-rate tool for looking into the future. It allows you to follow the trends in what customers say over time about your store, about their needs, and about the products and services that most concern them. Is there something new that they’re looking for? Some developing need that isn’t yet being met? If you can anticipate a growing market for new products or services, a declining trend in demand for established products and services, or any kind of change in what customers want or how they want it, you’re ahead of the game. You don’t need to wait until the leaders in your industry declare a new trend, or tell you about a new market – you can discover new trends and markets for yourself by means of well thought-out and clearly analyzed customer surveys, and become one of those leaders. 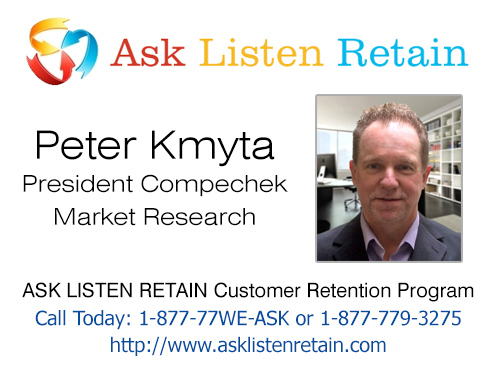 Compechek and the ALR system can give you clear insight into how your customers feel about your business, and into where the trends in your customer’s need and interests are going; these are the things that you need to know in order to keep your business ahead of the curve.